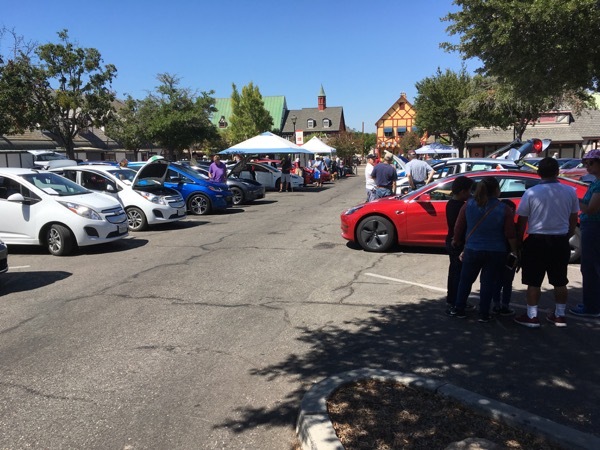 On a sunny day in Solvang, California, the Danish-themed town in California's Santa Ynez Valley, over 100 interested members of the general public came and learned about Electric Vehicles and Plug-In Hybrids from private owner EV enthusiasts and EV-knowledgeable dealers who had their cars on display. We had a wide variety of manufacturers and models. The following elected officials came to demonstrate their support for the environmental benefits of EV use and adoption: United States Congressman Salud Carbajal (24th Congressional District of California) and Third District Santa Barbara County Supervisor Joan Hartmann. Supervisor Hartmann put her daily driver Tesla Model S on display at the event. Alex Economou, Air Quality Specialist for the Santa Barbara County Air Pollution Control District, came with an informational booth about SBCAPCD incentive programs for EV ownership and other SBCAPCD programs. NDEW Electric Vehicle Show in Solvang, California. Solvang has a Danish theme to its architecture. Multiple EVs and PHEVs were on display at our venue, a municipal parking lot in the center of town near bakeries, restaurants and shops. Over 100 interested members of the public came to learn. Local Electric Vehicle (EV) owners will be available with their cars to tell you their experiences of EV ownership and operation. Join us and bring your questions about the EV world to our knowledgeable owners. It's a real, one-to-one, hands on opportunity for you to learn the benefits of EV ownership and see the vehicles inside and out. EVs have fast acceleration, silent, smooth running, immediate pedal response, and improved braking. EVs run virtually maintenance-free and have good to excellent safety ratings. Good for you, good for the environment, and beneficial to your bottom line. Consider never having to pay for gasoline, oil or major repairs again! National Drive Electric Week is a collaboration between Plug In America, Sierra Club and the Electric Auto Association. Presented locally by the Los Padres Chapter Sierra Club and Community Environmental Council. There are currently 52 attendees registered. Registered attendees report 534,769 electric miles driven.